Popularly known as 'Statia', St Eustatius was a thriving port during the 17th and 18th centuries, becoming known throughout the Caribbean as 'The Golden Rock'. In fact, for a time, it was the busiest seaport in the world. Much-favoured as a tax-free haven, it grew to a population peak of around 30,000. Given St Eustatius' relative anonymity today, you might think 'how the mighty have fallen'. But any visit to the island will dash such foolishness from your mind. Bathed in Caribbean sunshine, with only one town, Oranjestad (not to be confused with the Aruban town of the same name), St Eustatius a sleepy, pretty haven from another time. Made up of cottages and waterfront houses, Oranjestad is deserving of a wander, but then it's essential to explore the island's rural hinterland and rugged volcanic hillsides. 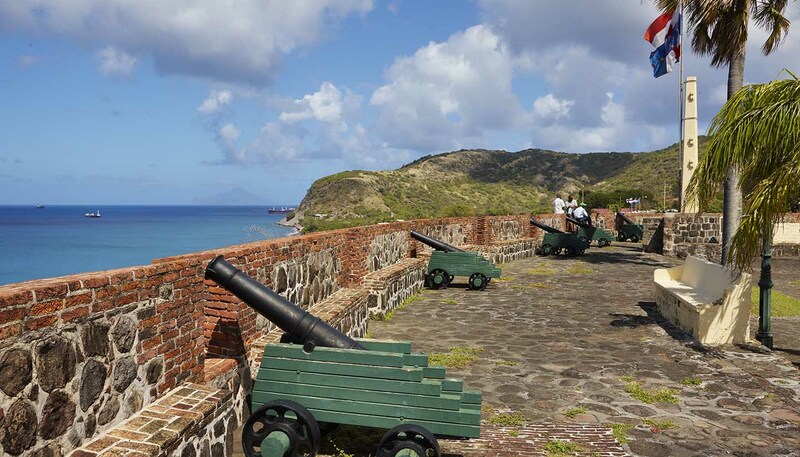 The decline of St Eustatius from the 19th century onwards – brought about, incidentally, by French conquest and the imposition of heavy taxes – has now halted. It's true that this is largely thanks to the influx of tourists. Like other countries in the region, St Eustatius became a special municipality of the Netherlands following the dissolution of Dutch Antilles in 2010. The foundations of the Dutch sea walls are now sunk beneath the clear waters of the bay today, though scuba divers and snorkelers can see many of the submerged ruins. Other attractions on the island include walking up The Quill, surfing off the northeast coast, and going on fishing trips. The nightlife is centred on the main hotels and restaurants, including dancing and local live bands, which may play one of the two different indigenous blends of reggae and calypso - 'Pim Pim' and 'Hippy'. Leave your troubles at the airport – St Eustatius is all about taking it easy. The National Office for the Caribbean Netherlands acts on behalf of the Government of the Netherlands. The Representative for the public bodies of Bonaire, Saint Eustatius and Saba represents the Government of the Netherlands on Saba. King Willem-Alexander since 2013, represented locally by Acting Island Governor Julian Woodley since 2016.